The Vigil of Stendarr is an order of holy warriors who fight in the name of the divine Stendarr. Vigilants can be found journeying across Tamriel in their dedication to wiping out Daedra and any other "abominations" (such as vampires, werewolves, and witches). The Vigil's base of operations in Skyrim is the Hall of the Vigilant, located south of Dawnstar. They also gather near Stendarr's Beacon in The Rift. The Vigilants in Skyrim are led by Keeper Carcette. 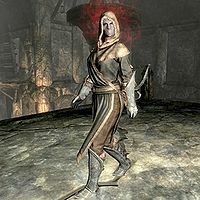 The Vigil has close ties to the Dawnguard in Skyrim; not only do the two factions have a similar focus, but the newly-reformed Dawnguard was started by two former members of the Vigil, Isran and Celann. Vigilants can often be found walking in groups along roads, or found individually in certain places. Any Vigilant that is not in combat will cure any diseases you have, if asked. If you have lycanthropy, they will not attack you unless you approach them in beast form. 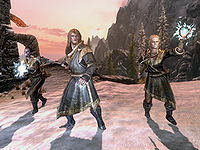 You may have to fight them during Daedric quests; for instance, when following Barbas at the beginning of the quest A Daedra's Best Friend, you might cross paths with a group of Vigilants of Stendarr who will attack Barbas and will have to be killed before you can proceed. During the events of the Dawnguard add-on, the Hall of the Vigilant is destroyed by vampires, and most of its membership is killed. Vigilant Adalvald and Vigilant Tolan survived and were taken for interrogation to Dimhollow Crypt. 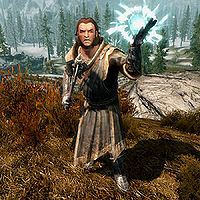 Vigilants of Stendarr make use of both one-handed melee attacks and defensive magic in battle. They are armed with a leveled mace (any quality from iron to Daedric), and all members have the Oakflesh, Healing, and Lesser Ward spells. Robes: either novice robes of alteration or novice robes of restoration. In addition to the gear listed above, Vigilants carry a belted tunic, which they wear when sleeping. They also carry two leveled healing potions and a potion of cure disease, a torch, and may carry a book or recipe (Physicalities of Werewolves, The Book of Daedra, Varieties of Daedra, Immortal Blood, Cure Disease Potion Recipe, or Resist Poison Potion Recipe). Vigilants will drop a small amount of gold on death. 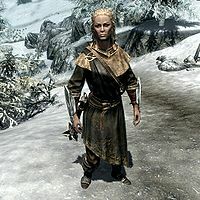 Keeper Carcette, Vigilant Tyranus, Vigilant AdalvaldDG, Moric SidreyDG, Vigilant TolanDG, VolkDG, AzarainCC, and FenrikCC are named Vigilants that can be found in Skyrim (although some do not technically belong to the Vigilants of Stendarr faction). 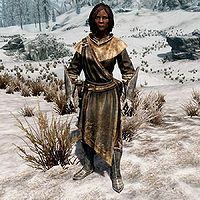 Other Vigilants, simply named "Vigilant of Stendarr", are detailed below. ^1This Vigilant is also the template used by Vigilant Adalvald. Charmed Vigilants are found in Ruunvald during the quest Bolstering the Ranks. A warlock named Minorne charmed a temple leader, Moric Sidrey, while he was excavating the Ruunvald site. Under her guidance, he gathered more Vigilants there, and they were all eventually charmed by her as well. They worship her as a god, and will fight to protect her against anyone who comes along. They die after Minorne is killed. "Stendarr's Mercy be upon you, for the Vigil has none to spare." "The suffering the Daedra caused will not go unpunished." "Walk always in the light, or we will drag you to it." "Wherever the Daedra hide, the Vigil of Stendarr will cast them into the light." "The Mercy of Stendarr does not extend to Daedra worshippers." "You're bloated with disease. 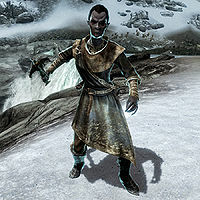 The Vigilant of Stendarr can help you, as long as you promise to never assist the Daedra." "Well met, friend. We've been chasing that fiend for a long time. On behalf of the Vigil, you have my thanks." "It's done, then. We've been chasing that fiend for a long time." "None escape the Vigil. All come into the light." "You're a Vigilant of Stendarr?" "Yes. Our order was founded after the Oblivion Crisis. We dedicate our lives to facing the threat of Daedra wherever they appear." "He is the God of Mercy. The patron of order and justice for all of Tamriel. We bring his compassion where none can be found, by cleansing all those who would offend his children." "And any other abominations that prey on mortals. Vampires. Werewolves. Witches. But the Daedra are the worst. Their callous disregard for our lives is abhorrent in the eyes of the God of Mercy." "They are profane creatures with no hope of redemption. They lure innocents to their deaths and corrupt the souls of all they touch. And their heretical artifacts grant powers to mortals that wreak havoc across Tamriel. They must be destroyed or guarded to prevent temptation." "Stendarr's Light purify you of your ills." DawnguardDG: Speak with the leader of the Dawnguard. AwakeningDG: Find out what the vampires are looking for. Bolstering the RanksDG: Find Florentius Baenius and recruit him into the Dawnguard. Be careful when using Healing Hands; if a Vigilant of Stendarr is healed by this spell while out on the road, there is a chance they will become hostile. They will also turn hostile if under the effects of Rally. If you accidentally strike a Vigilant of Stendarr while in combat, there's a chance that all Vigilants will turn hostile. They can sometimes be found carrying Daedric weapons, despite their opposition to all things Daedric. "Stop! We know you're holding a Daedric artifact. Hand it over." "Why should I hand you anything?" "The Vigil of Stendarr cleanses all Daedric filth from Tamriel. Give us any artifacts you have, or we'll purge you like all the others." "Fine. Take all the artifacts I have." "Wise decision. The vaults in the Hall of the Vigilant will guard this against future temptation." "I'm not giving you anything." "Then prepare yourself to receive Stendarr's Mercy." For more information on the Vigil of Stendarr, see the lore article. This page was last modified on 20 January 2019, at 18:27.